Musician's Home Sells in Hollywood Hills, In Need of T.L.C. The Mid-Century single-story home features a studio, gym, office, two fireplaces, four bedrooms, and three bathrooms. Musician Matthew Sweet has sold his Hollywood Hills West home for $1.68 million, reports the LA Times. The "showcase 1958 Edward H. Fickett model home" was built to look inward on the quarter-acre lot. The Mid-Century single-story home features a studio, gym, office, two fireplaces, four bedrooms, and three bathrooms. 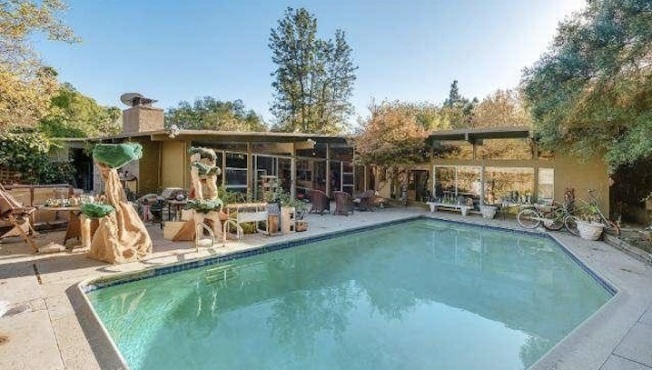 Walls of glass open to the "irregularly shaped swimming pool" in the backyard, and according to the listing, the house needs some T.L.C. Read the full story on the LA Times.